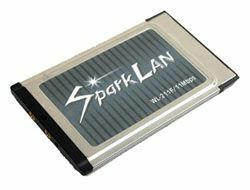 Device Name: SparkLAN 11Mbps PC CARD. hi and thanks for your wonderful site, although I ve got a little worry. I have a sony clie peg-nxv73 pda, but didnt come with the wireless card so decided to get a 11Mbps wireless LAN CFcard model WL-672 from ebay and again didnt have the software cd .